What did the Philippine National Hero eat? What foods did he write about? While overseas as a student, eye surgeon, and socio-political activist, what was his diet? Did he hunger for comfort foods like bagoong and mango jam? Why did he count the number of biscuits in a can and keep track of every centavo he spent on meals and drinks? What is there to know about Jose Rizal and Filipino food? 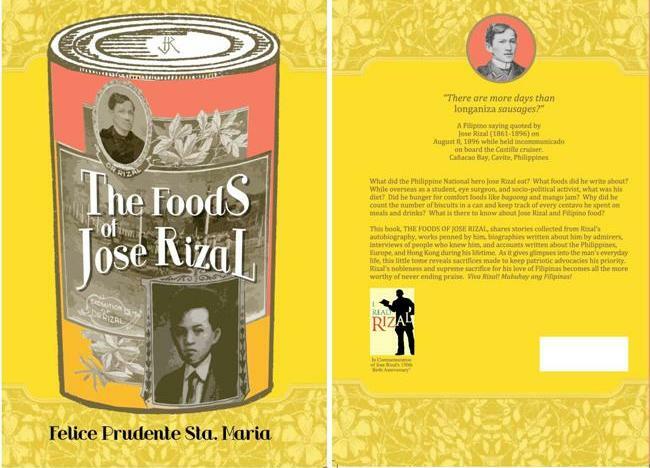 THE FOODS OF JOSE RIZAL by Felice Prudente Sta. Maria shares stories collected from Rizal’s autobiography, works penned by him, biographies written about him by admirers, interviews of people who knew him, and accounts written about the Philippines, Europe, and Hong Kong during his lifetimes. As it gives glimpses into the man’s everyday life, this little tome reveals sacrifices made to keep patriotic advocacies his priority. Rizal’s noblemess and supreme sacrifice for his love of Filipinas becomes all the more worthy of never ending praise. Viva Rizal! Mabuhay ang Filipinas! ‹ Suarez and Sons supports PreMYo Rizal!